Where the hell would I find time to make a podcast? It’s a common refrain I hear from people. And if you’re juggling a busy business and/or work schedule, not to mention family and other commitments, believe me, I get it. Speaking to Angela Henderson on a recent episode of Should I Start A Podcast, proved that there really is no excuse if you’re clear on what your why is in your business and your life. Even with balancing the demands of her business consulting business, motherhood and a battle with depression she was still able to create a podcast of her own – Business & Life Conversations with Angela Henderson. Her pared-back, simple approach and anti-hustle style is instructional and her results inspirational. This concept of hustle is common in the entrepreneurship world. But this idea of working longer, harder and faster than everybody else, doesn’t work for everybody, and in fact can be detrimental. As Angela says, “I see a lot of big entrepreneurs making as if the hustle is the new normal, and because they have huge audiences, we’re not focusing on what’s normal and what’s not normal anymore. “For me it’s around mental health. A lot of people are talking about hustle, but, as a mental health clinician of 15 years, I really think you can still work hard and do really well as an entrepreneur without the burnout,” she says. A lot of this comes back to the curse of the inexperienced entrepreneur, trying to do too many things, constantly swapping and changing, and not doing anything very well. As Angela says, starting a podcast wasn’t just for shits and giggles. There’s a clear strategy behind it. The intimacy and humanism of the podcasting format proved an ideal marketing tool. It enabled her to slow down, listen and understand her audience and the needs and concerns of her potential customers. Sharing people’s successes, failures and lessons learned has been a win all round – for Angela, her guests and her listeners. Even starting out in a small and controlled way, Angela has already had some 50 people contact her to be on the podcast. “They’re letting me into their life, and if they let me into their life, they’re going to talk about me to other people, even if that’s just one other person, I’ve now gone from 50 conversations to 100 conversations,” she says. For Angela it all comes back to her why: Giving back to the community and making sure people take care of their mental health through the journey of entrepreneurship. And podcasting proved a great way of sharing her message and engaging her customers in a meaningful way. 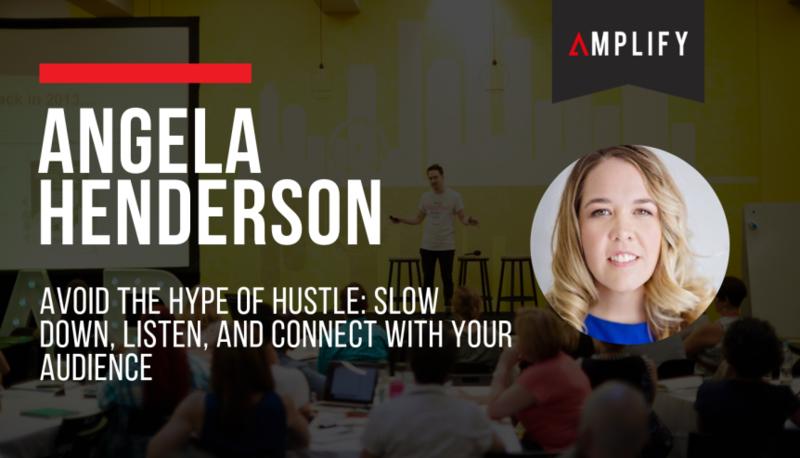 Listen to my entire conversation with Angela Henderson here.